Our space has 2 bedroom's with beautiful ocean views. Perfect for active getaways, where mountains meet the sea. We are in Bundoran, a traditional surf town along with Wild Atlantic Way. Located in front of some of Irelands finest surfing breaks, this apartment has been a great hit for international and domestic surf travellers as the living room and both bedrooms have a clear unobstructed view of The Peak/Inside left/3D/Main Beach. Hosted by life long surfer who has been surfing in the region for over 25 years and full of tips and local knowledge on all things surf, outdoors and great food. The apartment is also conveniently located next to waterworld,playpark and the amusement park which has been great for guests with children. The summer also has a carnival which is always great fun! If your looking for a night out on the town then don't worry about Taxis as we are 2 minutes from the main street which has plenty of good night life, with many pubs, night clubs and restaurants. Bundoran is a great town for live traditional Irish music in quiet cosy pubs off the beaten track. The locals are known for a good lock in and trad music session! We also have a niteclub for the party goers and great live rock and roll about the town. Within 30 minutes are the mountains of Ben Bulben and Ben Wisken and the stunning Gleniff Horseshoe. Our place is a great base to visit Slieve League, the highest sea cliffs in Europe. Three times higher than the cliffs of Moher! We look forward to welcoming you to our home and promise you won't want to leave! I'm Ciaran, originally hailing from Wales, I've travelled the world in search of waves and landed in my home away from home Bundoran. An avid surfer, I enjoy giving guests the low down on the local breaks. Bundoran is a beautiful place, and great if you're looking for an active holiday where you really get to know Irish locals. Great base to visit the Wild Atlantic Way in comfort with a local host! Amazing views of the local breaks! The town boasts a beautiful scenic cliff walk, with natural sea arches and caves to explore. 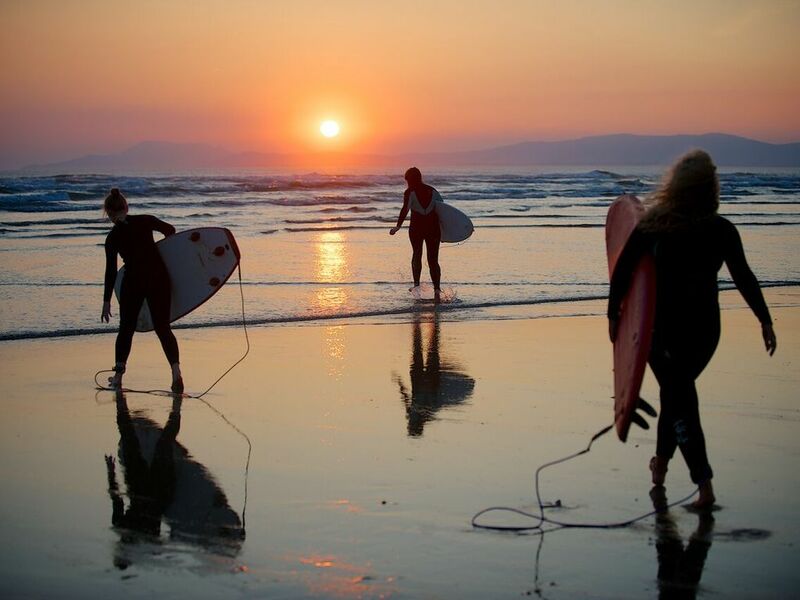 You can take a surf lesson, go pony trekking along the sand dunes and dine your heart out all within a stones throw away.